Know how to fight fair, it can save your marriage! - CREATIVE CONFLICTS! You are here: Home / Marital Fighting / Know how to fight fair, it can save your marriage! 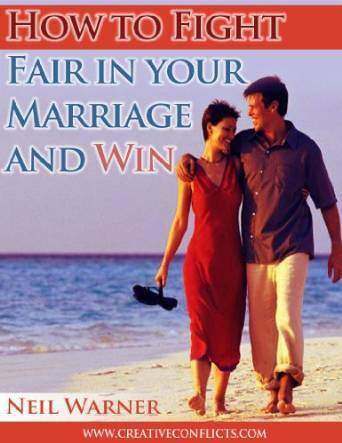 Know how to fight fair, it can save your marriage! The secret of a steady happy relationship is not to avoid marriage conflicts, but process disputes in such a way that both sides’ needs are included and respected without allowing anger to destroy love and trust. Is possible to have guidelines for fighting fair in marriage. Fighting fair in relationships is the tool presented here. Learning the skill of fighting fair will restore your confidence in the possibility of defending what you value and need, while at the same time, you will listen to and respect the other person’s needs. This is done following the rules for fighting fair in marriage. This book also solves the core question about how you can assert your personal needs, while also caring for the relationship, and thus have a healthy marriage.